A manufactured run in the top of the ninth inning fractured a 4-4 tie, surging the Blue Rocks into a lead that they would not relinquish in the final game of the season at LewisGale Field. Wilmington’s 5-4 victory was a byproduct of opportunistic baserunning and opposition miscues, as the Sox made three errors, including one pivotal one in the decisive ninth. Whit Merrifield drew a one-out walk from Jeremiah Bayer and advanced to second after an errant pick-off attempt skipped past first. Two wild pitches later, Merrifield touched home plate to put the Blue Rocks on top. With the score even at two through six innings, both teams plated a pair in a wild and scary seventh, in which Salem right fielder Bryce Brentz was carted off the field after backing into the wall in pursuit of a fly ball. With Merrifield at first, Carlo Testa’s deep drive to right pushed Brentz to the track. The ball bounced off Brentz’ glove and rolled into the right-field corner, while Brentz drilled the wall, fell down, and laid motionless on the ground. Both Merrifield and Testa rounded the bases, providing Testa with an inside-the-park two-run homer. Meanwhile, Brentz remained on the ground as Salem Athletic Trainer Brandon Henry charged onto the field. Brentz sat up, stood up on his own, and took a few steps to a cart that helped him off the field. Brentz said that he felt a very sharp pain in his back when it happened, but he appeared to be alright after the game, walking around the clubhouse with his teammates. In the last of the seventh, Salem rallied to even the score, with Heiker Meneses bringing the spark with a one-out single, his third hit of the ballgame. Zach Gentile singled Meneses to third, and the incoming throw bounced away, allowing Meneses to score. Later in the frame, Miles Head smashed a single to center to score Gentile and tie the game at four. Both teams made three errors, leading to four unearned runs in the ballgame, three of which were scored by Wilmington. All three Salem errors were charged to the pitchers. Starter Anthony Ranaudo made two errors, one fielding and one on an errant pick-off attempt, while Bayer’s miscue in the ninth also cost the Sox dearly. Salem also lost third-baseman Kolbrin Vitek early in the game. Vitek aggravated an oblique injury and departed in the middle of his second at-bat. Gentile took over for Vitek with a 1-1 count in the third inning, and Gentile flew to left to end that frame. Ranaudo dealt four innings, allowing two runs (both unearned) on three hits, while striking out six and walking four. He received a no-decision, and it was Bayer who was saddled with the setback, falling to 7-3. 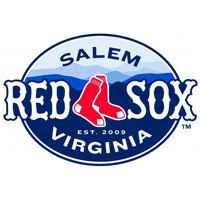 The Salem Sox will take two days off before returning to the diamond on Wednesday in Winston-Salem for the final six-game road trip of the season.